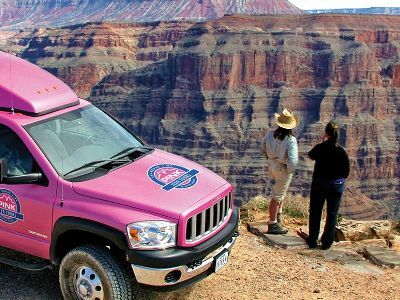 These Grand Canyon jeep tours from Las Vegas are extremely comfortable and more personal than bus tours thanks to the small size of the groups. With these narrated tours you will be in experienced hands of great tour guides who do everything to make your trip enjoyable! Leave the buzzing Las Vegas Strip behind and explore one of the greatest natural wonders - Grand Canyon, in all its glorious beauty! Most of these tours include an off-roading, a hearty lunch, fuel surcharge and a pick up from all major hotels in Las Vegas. These combo trips are among the most popular Grand Canyon jeep tours - you will get to experience the best amenities that the Grand Canyon has to offer- jeep, boat and a helicopter ride! 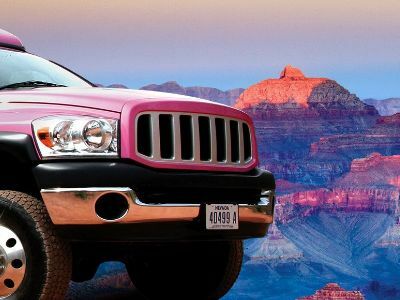 The luxury SUV (which is actually a very comfortable Pink Jeep) will take you to the West Rim through the Joshua tree forest, along the Indian Diamond Bar Road. 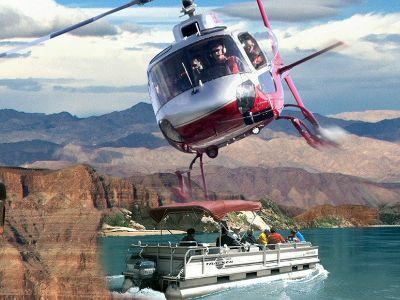 Once there, a helicopter will descend you down 4,000 feet to the Colorado River where you will take a fully narrated boat tour. Once back on the Rim, you will visit the Eagle Point where you can explore the Indian village; then you will visit Guano Point for dramatic views of the Colorado River and some pictures. You can also visit the Skywalk (the price is not included - pay separately). This is an all-world journey that will take you, by airplane and off-road vehicle, to some of the most beautiful vistas along the South Rim of the Grand Canyon. 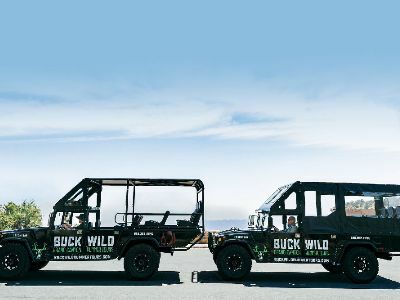 The 10-hour long Grand Canyon jeep tours start with hotel pick-up service that takes you Boulder City Airport where you board an exclusive Twin Otter Vistaliner. You fly above the wondrous landscape of Hoover Dam, Lake Mead and the awesome Grand Canyon. Once at the South Rim you need to get ready for your next exciting adventure. Climb into an open-air jeep for an exclusive tour of the South Rim. Once at Bright Angel Lodge you can enjoy a complimentary boxed lunch and enjoy an IMAX movie on the Grand Canyon during your one and a half hour unguided time. Your journey ends with a flight home and hotel drop-off. Must be 18 years of age or older to participate on this tour. Valid government issued identification is required. Enjoy a day driving in one of the most remarkable landscapes in the world before visiting the Colorado River. These eleven hour long Grand Canyon jeep tours from Las Vegas start with a scrumptious continental breakfast before taking off down the road to Hoover Dam for a quick photo stop. From here you will travel down the famed Route 66 while having a photo opportunity at Hackberry General Store and Museum. Once at Peach Springs, Arizona you will travel through the Hualapai Indian Reservation until you reach the Grand Canyon. From there you will traverse down a 22-mile road until you reach the mighty Colorado River, where you will enjoy a boxed lunch next to the riverbed. You can relax on the return trip taking in a few more scenic sights on the way. These Grand Canyon jeep tours from Las Vegas will take you to the Grand Canyon West Rim, which is home to the Hualapai tribe. The itinerary goes through theHoover Dam bridge, and Joshua Tree forest. Once on the West Rim, you can take an optional Skywalk which is not included in the tour price - pay separately $30 at the West Rim). South Rim is so remote that there are very few Grand Canyon jeep tours departing from Vegas that take you there. 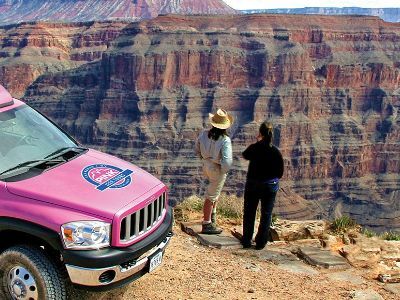 So here is your chance to explore the South Rim with Pink Jeeps! On the way to the South Rim you can admire the most scenic views of mountainous horizons and pine forests as the 4X4 jeep takes you along the historic Route 66through, through theMojave Desert. At the South Rim, you will have a scrumptious lunch, a fully narrated 3 hour tour, and possibility to take unforgettable pictures along the panoramic Rim Trail. Pink Jeeps combined their two most popular tours into one! If you are pressed for time, you could see the top two Las Vegas attractions in one tour. These Grand Canyon jeeps tours include exploration of the West Rim and the Hoover Dam - all in one day! You will get a briefing on the most important highlights of the two attractions - history of the construction of the Hoover Dam, geological history of the Grand Canyon. You will stop for unforgettable pictures and learn facts about living creatures of the region. With Hummer H2o ff-roading to your West Rim destination is completely effortless! 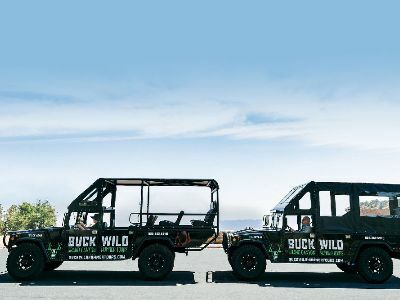 Not only do these Grand Canyon jeep tours include hotel pick up and lunch, they are also customizable - you have the option to add helicopter, boat ride or Skywalk or all three of them to your jeep tour! Your Hummer H2 will take you to the Hualapai Ranch located at the West Rim of the Grand Canyon through the Mojave Desert, the Joshua tree forest filled with ancient trees. Once at the destination, you will have 3 hours to have your lunch and to explore the Grand Canyon by foot or helicopter/boat should you choose the upgrade.